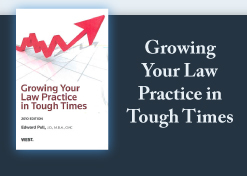 Two recent events got me thinking about the marketing challenges that sole practitioners have. In August I did a podcast interview with consultant Audrey Rubin who discussed what lawyers should know before opening their own practices - a topic of great interest to the many lawyers who want more freedom and control in their lives. Just days later I had a coaching session with a lawyer who faced a move from New York to California where her husband was to enter a specialized education program. In doing so she felt that she would have to start her solo practice anew, since all of her extensive network of contacts and family were on the East Coast; and her concern was how to make herself stand out and be noticed. We reviewed a variety of tactics, including a firm name that conveys the basics of her practice (see our Tip) and establishing a strong online presence. There is no one tactic that will cover the waterfront of opportunities to communicate with your marketplace. It becomes a question of your comfort zone, your creativity, your time availability and your budget. Above all, a lawyer looking to enter solo practice needs visibility, an image and message that conveys a substantive assurance that you can handle what is important to prospective clients. You can check this out by asking your current clients or other lawyers you have worked with to react to your message and to suggest others that they believe would be effective for you now that they've actually experienced your services. Be able to articulate a message about what you do and convey it with clarity, brevity and power. There are innovative ways for solos to be memorable and differentiated from other lawyers. In the past, I have blogged about lawyers like California's Laura Wasser, who had a tequila drink named after her. The beverage promoter said that the drink "captures Wasser's spirit." The drink was rather highly priced as are the fees of Wasser, a divorce attorney. If such tactics work to reach your target clientele, why not try them? So far as the ultimate concern of the client - and legal ethics - the quality of legal service and not the degree of salesmanship and promotion is what's important. Don't worry that others may seem to "be ahead" in the marketing game. Stay within yourself and focus on who you are, what you can do and what you want to do. Don't forget to sign up for the Midwest Law Firm Management Conference on September 21st! Breakfast in Chicago: On September 20th, I'd like to get together with clients and colleagues in the Chicago area. Everyone who has read my LawBiz® Tips electronic newsletter, bought one of my books or audio products, or reads my blog—you're invited to join me for breakfast...on me! We can chat about the business of the legal community, learn about some trends that I see coming up, meet with other legal professionals in the area and network to your heart's content. Just send me an email R.S.V.P. at edpoll@lawbiz.com if you're available Monday, September 20th at 7:30 a.m. I'll send you the location by return email. Hope to see you there!